With the Christmas party season well underway chances are you’re being faced with platters of naughty finger food everywhere you go. I know I am. Despite best efforts to stay to stay healthy it can be really hard to make nutritious choices at this time of year. Be it a work event, a family gathering or a picnic with friends it’s easy to undo 11 months of hard work in December. But, don’t let a ‘slip turn into a slide’ is my advice – don’t fall off the healthy bandwagon at home as well as when eating out. Because feasting wisely when preparing festive meals in your own kitchen isn’t difficult. It means finding recipes that look and taste indulgent but that are still really nutritious. These salmon, ricotta and zucchini bites are a great example of a recipe for healthy festive nibbles. Not only are these gluten free bites packed with protein and omega-3 fatty acids, they’re also easy and inexpensive to make. 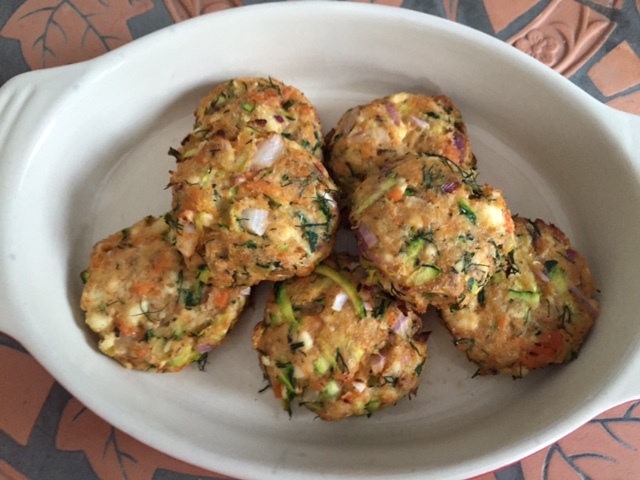 And, although called “bites” (each one is made from only a tablespoon of mixture), you could easily prepare them bigger and use them as burgers. I recommend oven-baking versus frying – to eliminate the need for extra oil and to reduce the risk of them sticking and coming apart in a frying pan. Of course you can replace the psyllium husk with 1/4 to 1/3 cup of breadcrumbs (of course doing so will remove their low carb and gluten free credentials). Squeeze any excess water from the zucchini and add it to a mixing bowl with the diced onion. Drain the canned salmon, remove any bones and then add to the bowl. Add the ricotta, psyllium husk (or breadcrumbs), lemon zest and juice and then the egg to the mixture. With clean hands evenly combine all of the ingredients, seasoning with salt and pepper along the way. Line an oven tray with baking paper and lightly grease with olive or coconut oil. Using a tablespoon of mixture each time create individual bite sized pieces. Flatten each into a small disc shape and place onto the baking tray (allow 1-2 cm around each disc). Once finished cover with plastic wrap and place in the fridge for 30 minutes (or longer) to set. Remove from the fridge and cook in a pre-heated oven at 180C for 20 minutes or until they start to brown. Turn over half way through cooking for an even finish. Do you have a go-to recipe for healthy and inexpensive Christmas nibbles that can be prepared easily at home? If so I’d love to hear about it. 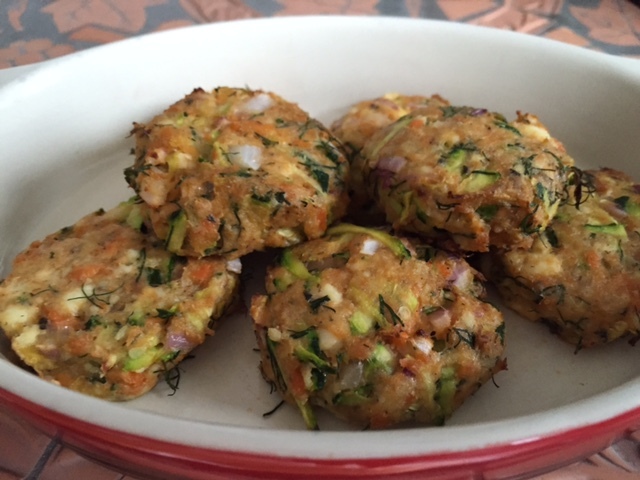 Tags: dill, fishcakes, gluten free, recipe, ricotta, salmon, zucchini. Bookmark the permalink. Thanks Linda – they are and they’re really simple to make too! Thanks Linda and yes it would work well as an entree – or even as I said upsize and have them as fish burgers – I’d love to know how they go or any variations you try if you make them….. Sounds delicious Linda – lime and chilli would add a great extra kick! Can’t wait to see the recipe Linda – did you use canned or fresh salmon? Sounds great and yes wild caught salmon is so much better for you than farmed…. Oh, I am pinning this! Love the idea of serving this as an appetizer for Christmas! Thanks Deanna – yes great for Christmas because you can prepare in advance and chill in the fridge…. Hi Laura, I don’t find the overeating as being my problem as much as eating things I normally avoid. Stuff like gooey cheese, salty chips, and sweets are far too common although they are not part of my usual diet. And, even worse, I’ve been to many a holiday party when that’s all the choice there is. Very frustrating to even the best of intentions. I’ve been replacing breadcrumbs with zucchini and ricotta (and sometimes avocado) in meat balls and such with great success. These look delicious. Love the idea of making small ones to serve as part of a buffet. Liz – I agree – as I said in the post it’s really not hard to make healthy festive nibbles – but I do think many people take the easy way out and opt for finger food that goes straight from packet to plate! Your meatballs sound great too – will have to look out for your recipe….Happy Christmas too! These sound so wonderful~I’m always looking for a way to use canned salmon – it’s such a bargain here compared to fresh/frozen! 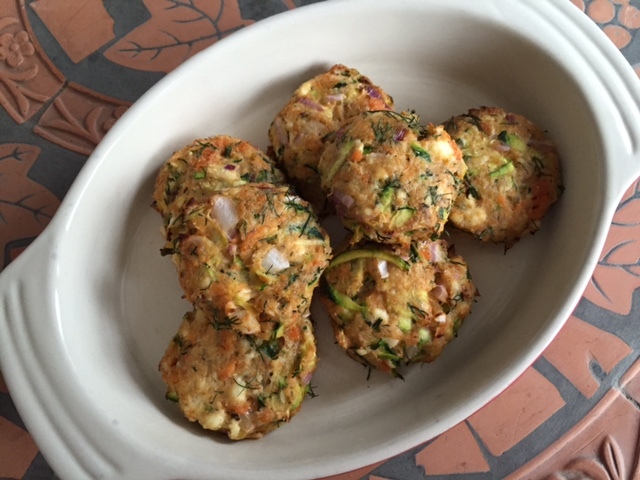 Yes agree and it tastes just as good as salmon from the fishmonger when made into these fish cakes…. Love the flavours in there. … sound intersting. Love fish cakes and specially since it is fried. These look so yummy! Thanks Nandini – I baked them in the oven but you could easily fry them too. Ha ha! You could go either way but baked works well – and is healthier of course….